When approaching the art of public speaking we are often overwhelmed with the amount of best practices we have to learn and memorise. All the rules of ‘what to to do’ and ‘what not to do’ can be very distracting when focusing on stage delivering our message in a most engaging manner and wow our audience. It certainly is no wonder that many become stage fright when it comes to presenting in public. For our next December event we are very pleased to have Peter Gasston, who will be sharing his experience as a professional speaker, and especially enlighten us on the things that individually matter to keep the show rolling. In the second part of the evening we will look into the awkward moments when we’ve forgotten what to say. A few fun exercises on improvisation for certain will lift our confidence. This session will be lead by Michael R. Lorek. Do you recall those awkward moments when you have forgotten what you wanted to say while your audience in great expectations looks at you? Or having had confidential doubts even far before you had to enter the stage. A good preventive remedy I identified are improvisational exercises to keep the conversational flow going; no worries, in our safe environment they definitely will be fun, and gained confidence for certain will be a positive byproduct. Peter is a veteran web developer who now works as a technologist at rehabstudio on projects for clients including Google and Facebook, and in partnership with some of the world’s biggest creative agencies. 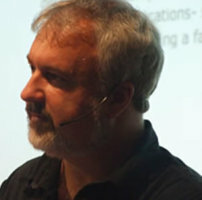 He’s the author of The Book of CSS3 and The Modern Web, and has written for Net Magazine, Smashing Magazine and A List Apart. In his spare time he ‘relaxes’ by reading voraciously, supporting Arsenal, and going on day trips to castles.